Coca is ubiquitous in the Bolivian Andes. Because of President Evo Morales' policies and the work of indigenous lobby groups, the ancient and traditional practice of cultivating coca is once again flourishing after decades of being driven underground. The once-sacred, often-reviled act of chewing the leaves is now regarded as mildly trashy by the upper echelons of Bolivian society, but little more than that; coca leaves are put into everything from soaps to booze for gleeful tourists to chuckle about at Bolivian outdoor markets and mate de coca, coca tea, is served everywhere as an effective remedy for the nausea, dizziness, and sleeplessness that comes while adjusting to the altitude on "el techo del mundo," the roof of the world. Coca, however, is not so well-regarded outside South America. It has become synonymous with one of the plant's more notorious alkaloids -- cocaine, of course -- that seems less suited to the great tan sweeps and valleys of the altiplano or even the bustling, diesel-tinged hills and stairs of La Paz and more part of the hollow-eyed pseudoglamour of a Los Angeles nightclub. Its reputation does bring travellers to La Paz, lured by the promise of the unusually high-quality coke sold out of the San Pedro prison, who do nothing but sleep all day and talk, drink, and snort line after line all through the night. But, as any paceña will tell you, "La coca no es la cocaina" -- coca is not cocaine. If you visit the Museo de Coca in La Paz's witch's market, you learn the history of la coca and its connection to pre-Hispanic practices, and how the Catholic church did its best to distance the native Quechua and Aymara from their traditions so they would be better prepared to accept Biblical beliefs, or a reasonably syncretic facsimile thereof. The debate on what to do about coca and cocaine still rages within North and South America. The United States routinely condemns its existence, but the US -- 5 percent of the world's population -- consumes half the world's illicit cocaine. ...I will kiss you quite red and feed you till you are plump. And if you are forward you shall see who is the stronger, a little girl who doesn't eat enough or a big strong man with cocaine in his body. In my last serious depression I took cocaine again and a small dose lifted me to the heights in a wonderful fashion. I am just now collecting the literature for a song of praise to this magical substance. It seems that Dr. Freud was collecting more than just literature. As cocaine began to catch on in Europe and the United States, it was prescribed for more and more problems, presumably by doctors who were also heavily into their own supply. Vin Mariani was also a big part of the newly created world. The wildly popular cocaine-infused wine was created by a French chemist named Angelo Mariani in 1863. It was sold as a tonic, and fairly flew off the shelves. 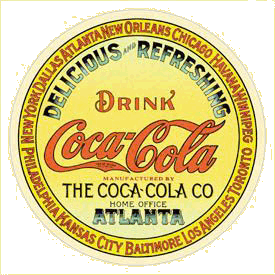 In 1885, an American named John Pemberton caught on to the craze and started making his own coca wine. Unfortunately for Pemberton, he lived in Atlanta, so his enormously successful career as a coca wine distributor never happened. It was nipped in the bud just a few months later, when Fulton County passed prohibition legislation. Piqued, Pemberton reformulated the coca wine recipe, removed the alcohol, kept the cocaine, and remarketed it as a sweet tonic called Coca-Cola. Eventually, as cocaine's addictive properties became apparent, its use in "tonic" drinks and as a panacea for mental, physical, and spiritual disorders was discontinued. But, as I already mentioned, cocaine is not the same as coca. The leaves, which in their natural form have few negative properties and many therapeutic ones, are still heavily regulated and classified in the United States as a Schedule II drug, indistinguishable from cocaine: Illegal for recreational use, but appropriate for some medical uses. That means coca tea or coca leaves can be seized and impounded at the American border. "La coca no es la cocaina," sure, but you try explaining that to Customs officials at the American border as they're taking away your twist-tied little baggies of leaves and leading you off to a secret room in the bowels of LAX. Despite the fact that many of the raw materials needed to turn coca into cocaine are supplied by American manufacturers, coca leaves remain illegal. All this background and these "therapeutic" claims may sound like nothing more than an attempt to justify a flirtation with an illegal substance, so consider this: There is one company in the United States authorized to import this otherwise-tightly-controlled substance. Illinois-based Stepan Company imports several hundred metric tons of coca leaves from Peru and Bolivia per year, extracts the cocaine to sell to pharmaceutical companies, and uses the leaves to make a syrup. If you guessed that concoction is part of Coca-Cola's secret recipe to this day, give yourself a pat on the back. You won't find it on the ingredients list, though. It's just part of that mysterious but innocuous-sounding nutritional category: "Natural Flavors." Sometimes, you run into beauty in unexpected places, like the down-at-the-heels port of La Boca, an area that was once a poor Italian immigrant community and is now a lively, thriving, and cheerfully trashy part of Buenos Aires, equally adored by tourists and the locals who make money off them. I wandered around happily taking photos yesterday until I found a taxi, whose driver scolded me all the way back to my apartment for walking around alone in such a bad part of town, although nobody had bothered me or even looked twice at me and my battered camera. I have always been drawn to "bad" parts of town anyway. I feel more comfortable where the people are loud and the colors are bright, and you find breathtaking items of carelessly casual beauty stowed in hidden corners. The truly dangerous parts of town are the grim ones, the concrete jungles punctuated only by garish and soulless strip malls, endless streets without trees, or colors, or even flowers in the windowsills to ameliorate the hellishness of the grey outside. Those are the places nobody should ever have to live, and the places I will never feel safe. But even the tiniest effort makes a difference, erasing the fine line between unrelenting, quotidian ugliness and transcendent beauty. This is it -- we're at the final game of Latin America's largest soccer tournament. I arrived a lukewarm fan of the "beautiful game," but now I get it. Watching the grace of the players as they fan across the field and the precision it takes to score a goal, along with the emotion and passion that the players put into it, makes it more like a complicated dance than a sport. But the sublime, ridiculous fans are what make this entire game glorious. And they don't do what they do for any particular reason -- other than that's what they do, occasionally attaining obsession so strange, so crazed, so over-the-top, that it transcends mere fanaticism and becomes pure art. And in the end, it's bringing the world together, one team at a time. Third place games feel a little... hollow. Brazil-Paraguay match. None of your wishy-washy American football fans who wear caps or occasionally maybe streak the field. This is real, crazed fanmanship right here. This is obsessive fanaticism done right. Bring it on, amigos! The Copa America tournament started a week ago. I have yet to attend a game, despite supposedly being in the process of making a documentary about its fans. Why, you ask? Excellent question. For one thing, the Copa America tournament is an enormous deal, especially here in Latin America. However, it has been classically ignored by media within the United States, because Americans, so the narrative goes, do not like football, except the American kind. I would like to extend an alternative interpretation. Americans love soccer. There are soccer moms and soccer dads and soccer leagues for kids. There are minivans packed full of cones and balls in every suburban and ex-urban neighborhood. Midwesterners, I am told, pack bars to bursting to cheer on Man United or Real Madrid. However, when two scrappy little independents from the United States show up at Latin America's largest and most famous football tournament, they are placed so far down on the totem pole that they do not receive much, if any, access. So many press from Europe and Latin America showed up that they get priority, and the very few Americans here are only allowed to cover games if there is room left over on the lists. There was no room. No room means no access, and the only American media that made it in was Univision, an excellent network but one with relatively limited appeal in much of the United States. Instead of bringing the culture of the game to Americans as we had thought we might, we instead spent the first three days of the tournament sitting in restaurants near our little apartment in San Telmo, eating steak, drinking Quilmes and occasionally cursing as we longingly watched the breath of excitable presenters on the bars' televisions steam out into the frosty air. Now that the hype of the Copa has faded somewhat and reporters are skipping games, we are getting placed on the press lists and can, possibly, if we are lucky, enter the press boxes at the stadiums. Now that we have access, of course we have fallen prey to a nasty virus, a most deadly South American disease cleverly disguised as a nasty head cold. Actually, it really is only a nasty head cold, but it has effectively grounded us. Either way, today we will watch the games as jealously as we had been earlier this week, but instead of enjoying steak and Argentinian beer at a Buenos Aires bar, tonight we will be in our apartment, sipping at hot lemon tea and cough syrup and gingerly nibbling at pieces of plain bread to quell our rebellious stomachs. Meanwhile, we will comfort ourselves with the certain knowledge that if we are sick, others will be as well, and once we are recovered enough to return to the Copa games other reporters will have fallen to this virus, leaving room for us on the press lists and taking their turn to watch us jealously on the televisions in their bedrooms as they sip at their honey-and-lemon teas. "Just scrap it all, and give us a rugby team," said Rodrigo. I laughed. "No, no," he insisted, "we Bolivians need to let go of the idea that we can play football. It hasn't been the same since they stopped letting us play games in La Paz." Much of La Paz is 13,000 feet above sea level, an altitude that occasionally requires acclimatizion and medication, and is occasionally fatal to some hapless travellers. The Bolivian soccer team is notorious for trying to schedule games there, where they easily beat their panting, vomiting, weeping competitors. In 2007, FIFA, soccer's worldwide governing body, banned games at altitude, thereby neatly disqualifying La Paz and sparking an enormous controversy within and without South America. The ban and ensuing discussion was eventually shelved until 2009, when the Bolivian soccer team spanked Argentina so thoroughly that the controversy was re-ignited. The rest of the soccer world seems to feel that Bolivia plays the games there on purpose because they have an innate acclimatization advantage. High altitude is no joke. At first, you may not be affected and you decide you are immune, and perhaps have a drink or light up a cigarette. Then, perhaps, your stomach begins to roil and you wonder whether you had bad eggs for breakfast. Then you feel wonderful for perhaps an hour, giddy and slightly high. When your lips begin to turn blue, you know you're being affected with altitude sickness. Then comes the vomiting. And that is without playing 90 minutes of a high-speed, high-intensity game. Edema never looks so pretty anywhere else. Tonight, the Bolivian team played against their old foes, the Argentina team, and tied 1-1. The game was in La Plata, at sea level. Nobody wept, fainted, or vomited, except perhaps some diehard Argentinian fans who had been convinced their team would run away with the first match. There was no comment from either FIFA or our friend Rodrigo, but the Copa America still has a month of games to go. Hello, and welcome to my new site as I attempt to gather my far-flung internet life under one domain. Please continue to stay tuned while I figure it all out.